Considering that I've spent the winter living in my Fit Flop Boots, my feet are in surprisingly good shape- they're hardly about to cause an obesity epidemic amoungst the garra rufa fish population. However, the clocks going forward acts as a reminder that summer sandal season is swiftly approaching & in turn, time to pay that extra bit of attention to feet. 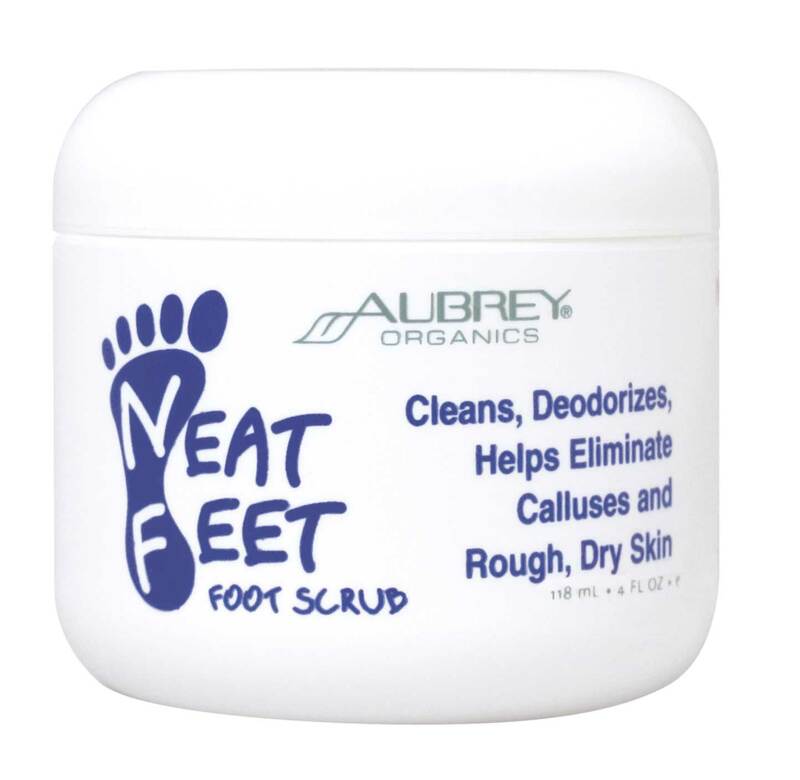 In celebration of summer, I was sent some products from Aubrey Organics to try http://www.aubreyorganicsuk.co.uk/, namely Neat Feet Foot Scrub and Feet Relief Massage Cream. The packaging isn't going to win any design awards but it's not offensive & I liked that it has a unisex feel. What's more, the rhyming names of the products appealed to me. First up, I tried Neat Feet Foot Scrub. I'd have preferred the scrub to be presented in a tube rather than a tub as I did find it quite messy to use. The colour of the product itself is muddy brown so not the most aesthetically pleasing. I liked that the scrub has a grown-up spicy scent, a step away from the standard peppermint offerings. It's difficult to pinpoint exactly what the scent is- I thought I could detect cinnamon although the packaging notes Cayenne pepper amongst other herbs & spices. The base of the scrub is coconut butter which I found made it a pleasure to use- it's a soft texture with the added bonus that it melts away easily, not leaving residue in the shower. I tend to choose quite abrasive scrubs with salt bases, for example, and unfortunately, I felt that the finely ground walnut didn't really deliver for me, despite not really suffering from dry skin on my feet. After my shower, I used Feet Relief Massage Cream. It's not a particularly luxurious product to use but wow, does it ever deliver results. It was easily absorbed, without greasy residue and left my feet feeling wonderfully soft, a feeling which lasted almost 24hrs. Again, the scent is difficult to pinpoint but the formula boasts natural deoderising properties so even if it's not for everyone, it's surely the lesser of two evils! Out of the two products, this was definitely my favourite. I'd happily keep a bottle in the bathroom as a grooming essential and would be prepared to pay about £12-15 for it so it was a nice surprise to find it's £8.57. I just found your blog through google! It is very informative! I am writing a marketing report and found your banned adverts post very helpful! So thank you for sharing! I always find scrubs fairly useless for treating the skin on your feet. It seems that type of rough skin can only be shifted properly with the good old foot file/mechanical buffer/garrufa fish/callous knife (yes I've tried them all- the last one resulted in a trip to casualty!) But I've yet to find a scrub that's made a noticable difference... Might try the foot cream though!